World Cup a chance "to show the whole world what they think about Africa isn't true"
(CNN) -- For many of Africa's elite footballers, this year's World Cup is not just about winning: It's a chance to show the world what Africa and its players have to offer. Cameroon captain Samuel Eto'o believes the World Cup is a chance for Africa to change its negative image. Eto'o, who plays for club Inter Milan, told CNN: "It's an occasion to show the whole world [that] what they think about Africa isn't true." "I think that many people, not only in Europe, don't know Africa, or are often only interested in the worst parts of Africa," he said. So far, though, the Cameroon side has struggled to show their flair, suffering a shock defeat to Japan in Monday's match. Cameroon, the highest-ranked African side at the tournament, lost 1-0 -- their first-ever defeat at an opening match in a World Cup. We're playing at home, we have the whole continent cheering for us. 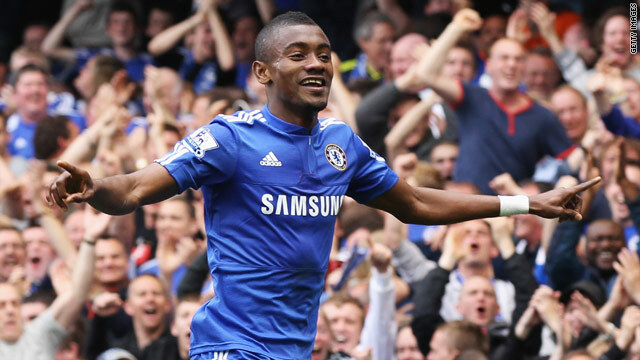 However Ivory Coast's Salomon Kalou, whose side will face Brazil -- one of the best teams in the Cup --on Saturday believes playing on African soil will be an invaluable boost to his team's chances of success. The striker for English premier league club Chelsea told CNN: "We're playing at home, we have the whole continent cheering for us." "We have a good team, we have top players, we have one of the best records in the world right now," he added. It's a sentiment echoed by Nwankwo Kanu, the veteran striker for Nigeria, whose team lost their first game of the tournament to a star-studded Argentinean line-up on Saturday. "Playing in Africa, with all the supporters behind you, this is the way to do it," he said. Playing closer to home also has its drawbacks, though, as Nigerian defender and captain Joseph Yobo explained to CNN. "We missed out in 2006 and everyone is still disappointed," he said. The Everton club player added: "Now we are playing close to home there is great expectation, but at the same time this is a chance to show that this area can do something." But for Ivory Coast defender and Manchester City star Kolo Toure, who has scored two goals for Ivory Coast in his 76 caps to date, playing in South Africa means more than just playing fine football. "When you play for your country it's special," he said. "You're playing for your father, your mother, for your uncle, for your cousin. Even if you don't have any bonus from that, you just enjoy and you just want to give everything you have inside you," he said.